The college has well experienced and friendly faculty team who help the students in their seminars, projects, and also guide the well by using brilliant technology. And this campus is fully Wi-Fi enabled campus, and the class rooms are well furnished with good laboratory, library facilities which is in advance form. Extra-curricular activities like yoga, music art and dance, craft, photography etc. are conducted in order to encourage the students. Hostel facility is also provided where 2 for boys and 1 for girls with all the facilities inside which is maintained in hygiene and with high quality of food. And the college also provides loan facility for those students whose annual income is less than 1.5 lakh. 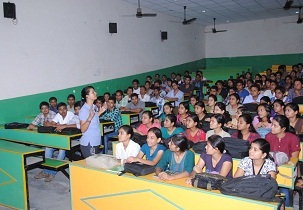 The college is very comfortable with rich infrastructure facility, with good auditorium, lecture halls, seminars, etc. And auditorium has the capacity of 500 people. And the college is also provided with good placement facility for the students. And the college is also very professional and is very supportive for the students. And 95% + students are offered with 100% of scholarship. Are you Interested in " Dr. K.N. Modi Foundation"? Please provide the following details.